Writing from Berlin, where the presentation of "The Seneca Effect" is going to start in a few hours. And here is another review by Ronny Wagner, in German, which I translated the best I could with the help of Google. "It would be a comfort to our weak souls and our works, if all things would pass away as they arise; but as it is, growth is progressing slowly, while the road to ruin is fast. "Lucius Anneau's Seneca"
The "Seneca Effect" describes many phenomena that grow slowly and quickly decline. As it turns out, collapses can occur in many different forms and everywhere. They have many different causes and develop in different ways. However, all breakdowns have certain consistent characteristics. They are always collective phenomena, that is, they occur only in so-called complex systems. Complex systems have the property that they are linked by many links. The collapse of a complex system is the rapid reorganization of a large number of such links. These nodes are in our case humans and their interactions with their environment. This is the research field of the social sciences, economics and history. All of these systems have a lot in common: a nonlinear behavior. In a complex system, there is no simple relationship between cause and effect. Rather, a complex system can multiply the effects of a small perturbation. Conversely, a disturbance can also be damped so that the system is barely affected. These facts mean that predictions in complex systems are impossible. Predictions by experts about the future development of a complex system are simply fantasy. You should not pay attention to them. But how can a person adjust to the Seneca effect? In fact, the Seneca effect is the result of trying to resist change instead of accepting it. The more resistance you make to change, the more that change will bounce back. It is no coincidence that philosophers often advise not to cling to material things that are part of this difficult and volatile world. That's good advice. In dealing with a collapse, we should therefore adhere to the advice of Epictetus: "We must set up the things in our power as well as possible, but take everything else as it comes." It follows that one can mitigate the "Seneca cliff", if one accepts the change, instead of resisting it. It means that you should never try to force the system into something it does not want to do. Jay Forrester: "Everyone is trying to 'steer the system' in the wrong direction." Politics seems to have given up any attempt to adapt to change. 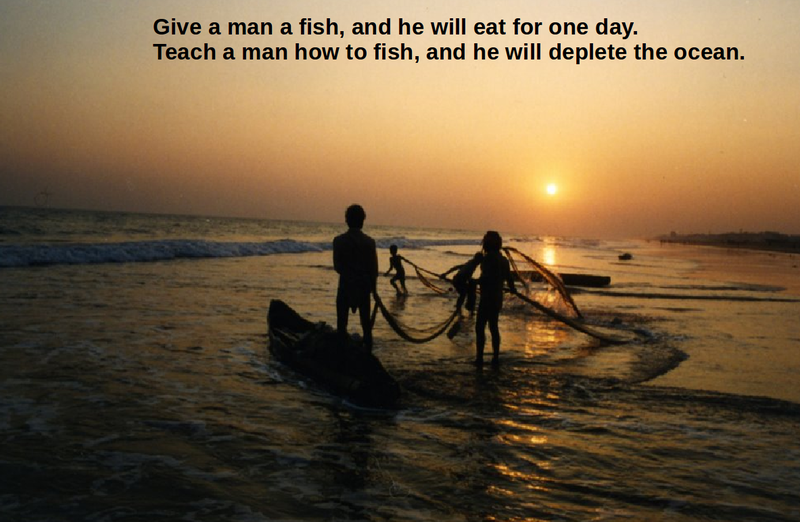 Instead, it resorts to simplified but powerful slogans that try to prospect the return to aimpossible prosperous past. People often make tremendous efforts to keep relationships together that should be closed. Also, we stubbornly cling to our workplace, though we may hate it and realize that we should seek a new one. Whole civilizations experienced a decline and disappeared because they did not adapt to change, a fate thatwe could experience, too, if we don't learn how to accept changes. It should not be forgotten that you can fix a problem, but not a change. You can only adapt to a change. Who remembers the Club of Rome? It was a late 1960s coalition of scientists who warned against overexploitation of the planet's natural resources through exploitation and exploitation. The first report to the Club of Rome entitled "The Limits to Growth" in 1972 created a tremendous response. Today, the 42nd report to the Club of Rome was published. The author, the Italian chemist Ugo Bardi, attempts to explain why complex systems collapse and how we can handle them. In the 1970s, the founders of the Club of Rome created a model to calculate the "limits of growth" generated by increasing resource use. 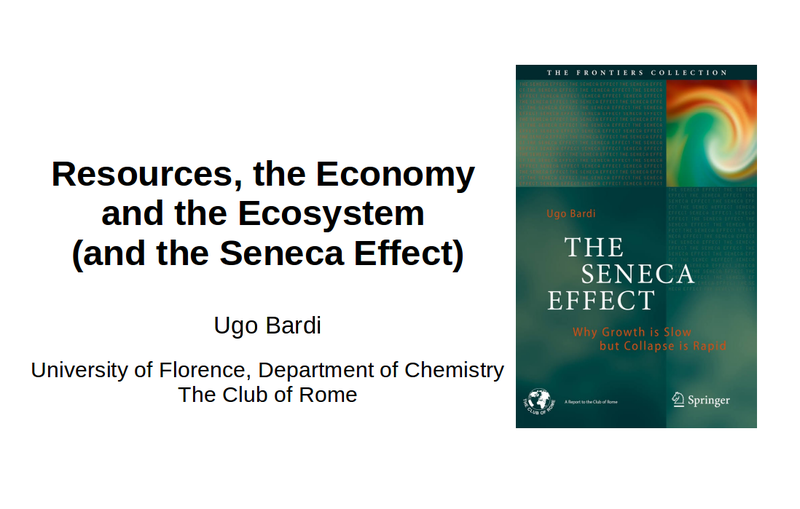 Ugo Bardi, himself a longtime member of the Club of Rome, continues to develop the theses of that groundbreaking work and presents his new study on the subject with his book "The Seneca Effect - Why Systems Collapse and How We Can Handle It". Bardi is particularly interested in the collapse of the ancient Roman Empire and the transferability of this historical event to the present day. The eponymous Roman philosopher Seneca is quoted by Bardi with the memorable phrase: "Growth is slow, while the road to ruin is fast." Seneca, born in 4 BC, was first an influential advisor to Emperor Nero and later fell out of favor. He foresaw the collapse of the Roman Empire well before its actual entry. Considering that Rome was founded in the 8th century BCE and reached its apogee in the 2nd century AD, one can attest that the Roman Empire grew for about a thousand years, to decay in a mere two to three centuries - Ugo Bardi calls this phenomenon the "Seneca effect". But why do complex systems collapse? Bardi tries to test the "Seneca effect" on the basis of the current world order. He explores the question of whether it would be conceivable that today's complex world system could experience a more or less abrupt collapse due to mutually reinforcing effects. According to Bardi, small causes can lead to big effects in complex systems. The problem is that modern industrial society, as soon as it goes into a crisis, usually tries to solve the problems it faces by expanding its governance structures - in other words, it is doing a fatal "more of the same" instead to initiate a change. So, inevitably, the so-called "tipping points" occur and that makes it extremely difficult for complex societies to respond to disorder with adaptation. One of the main reasons for the collapse of the Roman Empire was that the mines in northern Spain were no longer able to supply the silver necessary for coin production in the usual quantities. The cost of controlling the controlled territories became too high. In addition, trading on the Silk Road devoured large quantities of the coveted precious metals. The exhaustion of the gold and silver mines was followed by a cascade of feedback effects that was far more visible and spectacular than the influences that caused it. The Roman Empire experienced political unrest, internal conflicts and the collapse of its army. Ugo Bardi believes that this "Seneca collapse" can teach us a lot about the difficulties facing our current empire, the globalized world under Western hegemony. Due to the fact that the modern world has grown so fast, it could collapse with a bang, said Bardi. In his book, Ugo Bardi takes us on a journey through materials science and physics: he explains material breaks in ships and airplanes. Repeated, especially cyclic, loads lead to the weakening of the structure, to the so-called material fatigue. Cracks appear, which are barely visible at first - the break is often treacherous and in one rapid swoop: it is the "Seneca ruin" of the material. Bardi argues that in complex systems the unexpected and sudden change from one state to another can always lead to surprises. 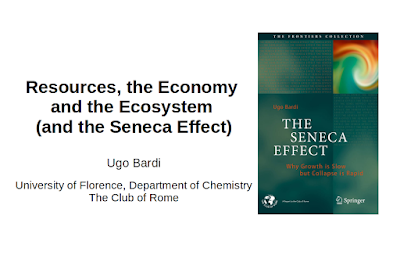 Bardi assumes that the "Seneca effect" can be observed within materials is the same effect, within certain limits occurring in social, economic and biological systems. All these systems would have to obey the general laws of thermodynamics, from which certain rules and tendencies could be deduced. But the findings from physics in many cases also tell us what we do not know. Thus, so far, there are no such things as an "avalanche equation " or an "earthquake equation" that would be able to determine exactly when and where an avalanche would go off or an earthquake would occur. Therefore, according to Bardi, despite all our knowledge of earthquakes, we can only protect ourselves from them by constructing buildings to withstand them in the event of a fall. Similarly, it is in the case of financial crises: due to the complexity of the financial world, no one is able to know exactly when the next collapse of the banking system will arrive. Bardi interprets the mortgage crisis of 2008 as a classic example of a "Seneca collapse" as the property market crash was much faster than its previous growth. In the transfer of complex physical systems to social and social processes there lies an innovative strength of the book, which contains numerous graphics. At the same time, however, it is also his enormous weakness. In order to transform physical phenomena into social phenomena, one needs a more or less rigid image of man. So Bardi assumes that "people tend to overuse resources." He misses the fact that the depletion of resources always has to do with power and governance structures that must be historically determined and are always changeable. Elsewhere, Bardi attempts to apply the "Boltzmann Gibbs distribution", which was developed to describe entropy in atomic systems, to the social distribution of monetary wealth. In the next paragraph, he relativizes his mind game. In some ways, one has the impression of listening to a professor who is chatting with himself. Ugo Bardi lacks a coherent social theory that could provide orientation in his quite interesting theses on the collapse of complex societies. As an additional problem, Bardi attaches high importance to the highly problematic theses of the British economist Thomas Malthus. Malthus developed in the early 19th century, named after him Population theory, which was directed primarily against the "excessive proliferation" of poor sections of the population in England. Already Friedrich Engels argued as the main objection that "overpopulation" basically does not represent a technical, but a socio-economic problem. According to Engels, capitalism is repelling an industrial "reserve army" of labor, a "lumpenproletariat", who in the worst case will be denied any right to life. Today, nearly one billion people worldwide belong to this lumpen proletariat - outcasts who do not even benefit from being exploited. Even today, all horror scenarios of the so-called danger of overpopulation are aimed at these people. But Bardi overlooks the fact that according to the World Food Report report, today's agriculture could feed twice as many people as currently living on the planet. Overpopulation cannot be the reason for the uncontrolled exploitation of resources. It is the current economic system that, with its inherent compulsion to maximize profits and drive economic growth, has caused enormous damage for about 200 years. Profits are more important than the satisfaction of human needs. Hunger and environmental destruction could be ended, distributive justice enforced. Despite the fact that Bardi misses this knowledge, he clearly takes position on this point and advises to develop economies that are secure against the unpredictable shocks of the global financial system. Likewise, Bardi advises that we "rid ourselves of the stubborn craving for fossil fuels that are ruining our planet." 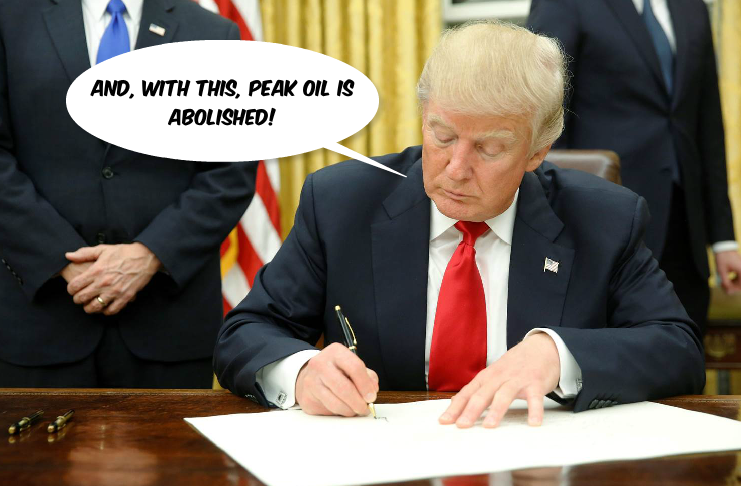 Because peak oil could have a similar effect to a "peak silver" of the Roman Empire. But even before this happens, several tipping points of the ecological earth system are threatened, which cause not only a "Seneca collapse" of our society but of the entire ecological system. Despite some daring scientific pirouettes, Bardi's new book provides important evidence that rethinking our view of the world is more than necessary. I gave a presentation focused on the Seneca Effect at the School of Physics in Les Houches this March. 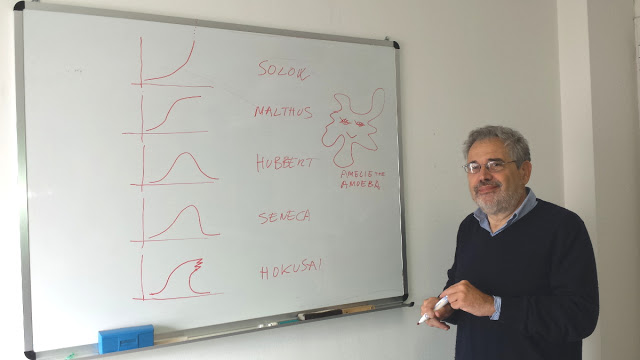 Here I show various concepts associated with overshoot and collapse with the help of "Amelie the Amoeba" (This picture was not taken in Les Houches, but in an earlier presentation in Florence). And here is an image I often use in order to illustrate the plight of humankind, apparently engaged in the task of covering the whole planet Earth with a uniform layer of cement, transforming it into Trantor, the capital of the Galactic Empire of Asimov's series "Foundation"
I moved on to illustrate the "new paradigm" of resource exploitation: the idea that mineral resources never "run out", but simply become more and more expensive, until they become too expensive. 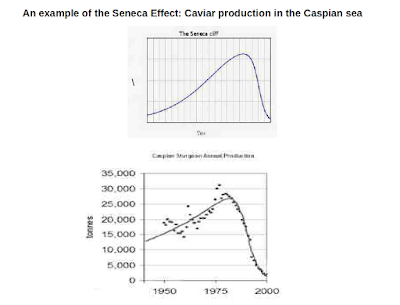 Then, I spoke about the Seneca effect, there is a lot to say about that, but let me just show to you one of the slides I showed during the talk: the Seneca Cliff does exist! 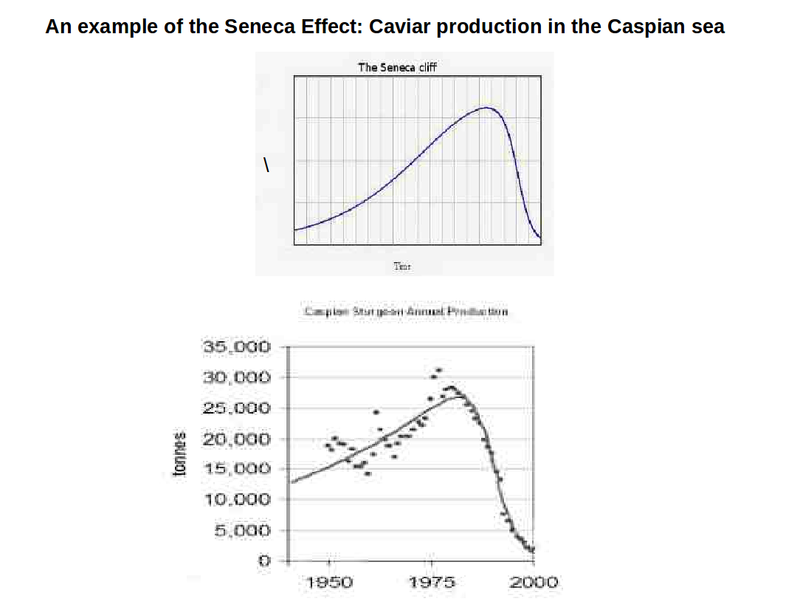 I also showed how the Seneca Effect can be used for good purposes, that is to get rid of things we need to get rid of. This is an image from a paper that we (Sgouris Sgouridis, Denes Csala, and myself) published in 2016. You see the Seneca cliff for the fossils, the violet part of the curve. It is what we want to happen and it would be possible to make it happen if we were willing to invest more, much more, in renewable energy. But, apparently, there is no such idea on the table, so the future doesn't look so good. The View From Les Houches: What is the origin of Collapse? 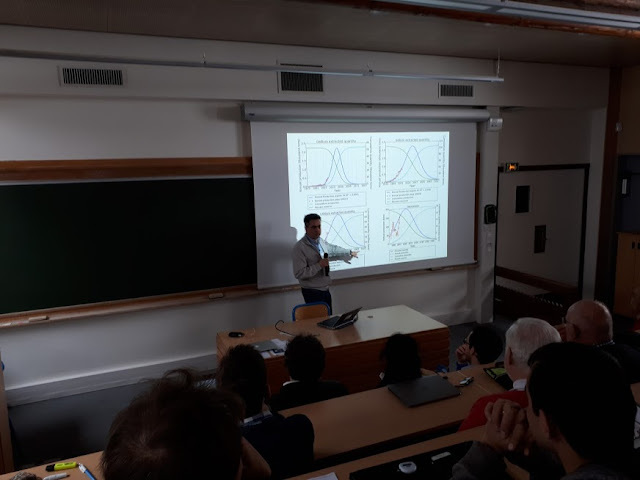 At the physics school of Les Houches, in March 2018, Gregoire Chambaz of the University of Lausanne gave a talk on the phenomenon of "collapse caused by diminishing returns of complexity." (The image above is not from Les Houches but from a meeting in Lausanne last year). In itself, it is already interesting that a meeting of physicists gives space to the idea of societal collapse, but the school of Les Houches was one of the rare cases of a truly interdisciplinary meeting. 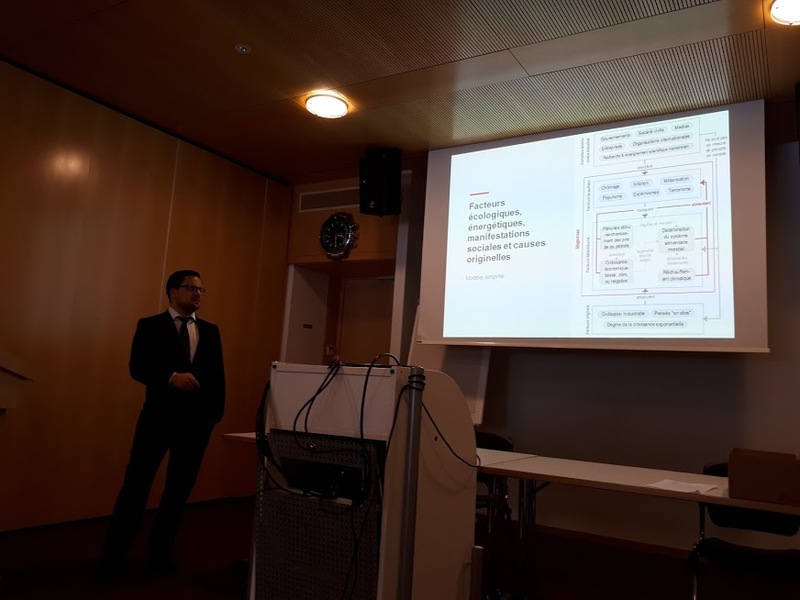 The result was a wide variety of approaches, including the talk by Gregoire Chambaz who approached the problem examining the concept of "diminishing returns of complexity" proposed by Joseph Tainter already in 1988. You can find a summary (in French) of Chambaz's work at this link. If you are a reader of this blog, you probably know Tainter's graphic to explain his concept. Here it is. The idea is that, as societies become larger, they must develop more and more complex control systems in order to manage the whole system. These control systems may be in the form of bureaucracy, an imperial court, the army, the church, the legal system, and more. And, as these systems become larger, they become unwieldy, rigid, and unmanageable. The effort needed to increase their size is not matched by the benefit they provide. According to Tainter, this is the ultimate reason for the collapse of large societies. As a model, Tainter's one has proved to be hugely popular and surely it is a "mind sized model," easy to understand and providing an immediate grasp of the evolution of the system. The problem is that Tainter's model has no evident basis in physics. There is no precise explanation of what would cause the behavior that Tainter proposes, not it is possible to measure concepts such as "the benefits of complexity." It is only a qualitative model. Can we model this kind of collapse using physics? Perhaps. In principle, there could be two reasons why the system stops improving its performance as it grows in size. One could be an effect of entropy. If you work in a large organization, you understand how, over time, it becomes a tangle of contradictory rules and of people and offices which seem to exist only to prevent any work being done (OK, I have in mind the University of Florence, but I am sure it is not the only case in the world). But how to quantify this effect? Then, the reason for this behavior could be another one. Maybe it is not an intrinsic property of a large system to lose efficiency as it grows, but an effect of the slow decline of the net energy that it uses. That would explain many things and I put together a tentative dynamic model a few years ago which seemed to work. We are working on improving it taking into account the dynamics of the Seneca Effect. It is a work we are doing together with my coworkers Sara and Ilaria, but it will take a little time before we publish it. Overall, the impression I have is that we are starting to develop an extremely rich field of studies, that of critical phenomena in complex networks. Tainter gave us a first indication of the way to go, but there is much, much more to do before we can say we have a solid theory explaining the periodical collapse of civilizations we observe in history. But we keep going. The View From Les Houches: The Return of Space Mining? In a previous post of mine, I was not optimistic about space mining. I said that there was nothing interesting to mine in space and that the whole idea was proposed by people who knew little or nothing about geology. Asteroids and other small space bodies contain no ores because they never went through the processes of deposit creation that took place on the Earth. No ores- no mining. Basically, the growth of interest in the subject may be more a symptom of growing desperation rather than something that could be plausibly done. I remain more or less of this idea: going to space to bring minerals back to Earth makes little sense, But, recently, I have been re-examining the concept and I discovered that there may be a logic in it if we just we change the target market from the Earth to space. Space is a growing business with plenty of interesting applications: communication, exploration, astronomy, earth monitoring and more. Elon Musk is no fool and if he developed a heavy rocket launcher, it is because he saw the need of it. So far, every gram of the devices and the structures sent to space came from the Earth's crust. And sending things to space is awfully expensive. 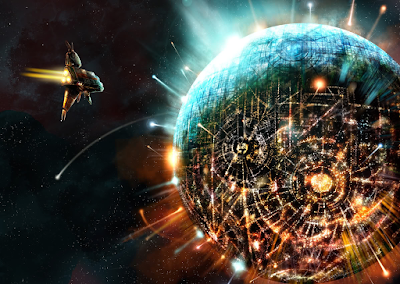 So, it could make sense to examine the possibility of assembling space structures using materials mined in space. It would still be difficult, perhaps impossible, to mine rare minerals in space, but asteroids are rich of elements such such as iron, nickel, aluminum, titanium, silicon and even carbon and water in the form of ice. These minerals are not there in the form of ores, but they form a sufficiently large fraction of some asteroids that extracting and purifying them could make sense. Take also into account that space is rich in solar energy that can be transformed into electric power by PV panels and that in space you have little to worry about pollution and greenhouse gases. Of course, putting together a mining industry in space is a task which was never attempted so far and the unknowns are enormous. It was discussed back in the 1970s when the concept of "space colonies" became popular. But, over the years, it became clear that humans are not made for space; too expensive and too dangerous. Instead, space is a good place for robots which can do the same things human can do in a better and cheaper way. And these robots could be made, at least in part, from materials obtained from asteroids. Is it possible? It depends on the trajectory of the world's economic system. If we manage to collapse as badly as some models predict, then space robots will soon become something made of the stuff dreams are made of - just like the angels which once were thought to be pushing planets along their orbits. But if humankind manages to keep a functioning industrial economy, then why not? Our robot-children could explore space and maybe build a new silicon based ecosystem, out there. The future is beautiful because it is always full of possibilities. Les Houches, March 2018. José Halloy of the Université Paris Diderot discusses mineral depletion in his presentation. Note how he utilizes Hubbert curves to estimate the trajectory of mineral extraction. He predicted that the dearth of very rare elements will negatively affect the electronics industry, perhaps killing it completely. 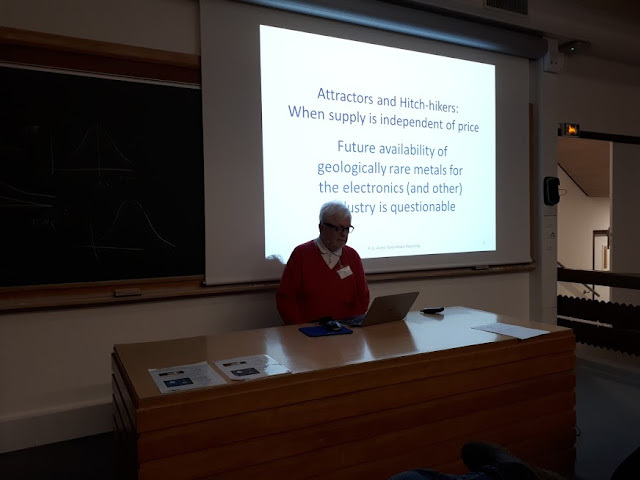 José Halloy's presentation at the Les Houches school of physics was focused on the availability of rare minerals for electronics. 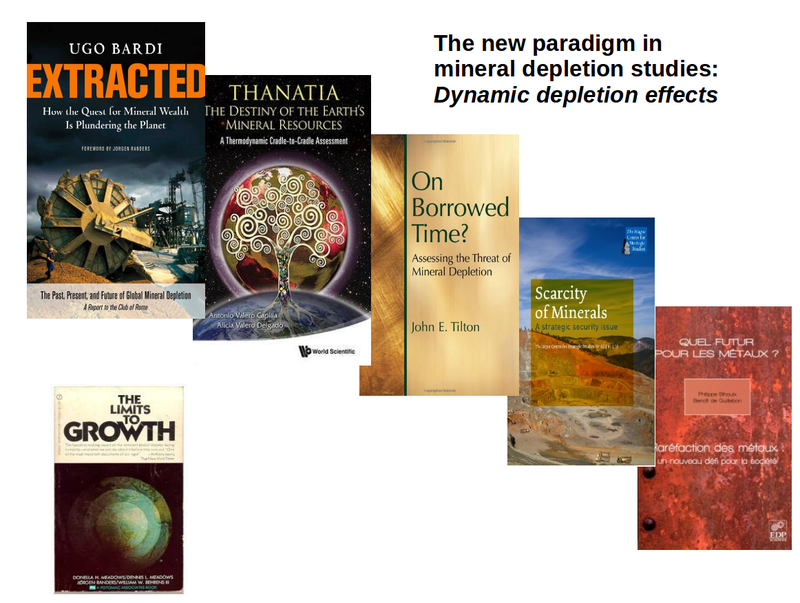 This is a problem that's rarely discussed outside the specialized world of the "catastrophists", that is of those who think that mineral supply may be strongly restricted by depletion in a non-remote future. In this field, Halloy seemed to side with the "hard" catastrophists, that is expressing the option that depletion will make certain things, perhaps even the whole electronics industry, impossible. The problem, indeed, is there: modern electronics is based on the unrestricted use of very rare minerals - the term "very rare" indicates those elements which are present only in traces in the earth's crust and which, normally, do not form exploitable deposits of their own. If you pick up your smartphone, you probably know that it contains several of these very rare elements gallium (for the transistors), indium (for the screen), tantalum (for the condensers), gold (for the electric contacts) and more. Most of these elements are "hitch-hikers" in the sense that they are produced as impurities extracted from the production of other elements: for instance, gallium is a byproduct of aluminum production. Whether we can continue to supply these elements to the electronic industry in the future depends on a host of factors, including whether we can continue to extract aluminum from its ores. In this sense, recycling is not a good thing since recycled aluminum, of course, does not contain gallium, because it has already been extracted during the refining phase. Note also that recycling tiny amount of very rare elements from electronic devices is extremely difficult and very costly. So, in the future, the supply of these elements is going to become problematic, to say the least. Does it mean the end of electronics? José Halloy seemed to be very pessimistic in this sense, but I think the question was not posed in the correct way. If you ask whether current electronic devices can survive the future dearth or rare mineral, the answer is obvious: they can't. But the correct question is a different one: what kind of electronic devices can we build without these elements? Here, I think we face a scarcely explored area. So far, the industry has been produced all kind of devices focusing solely on performance on the basis of the assumption that there aren't - and there won't ever be - mineral supply problems. Can we make a smartphone without gallium, indium and all the rest? That is, limiting the elements used to the basic ones, silicon, aluminum, and other common materials? It is a difficult question to answer because, really, it has never been addressed, so far. Yet, I think there are excellent possibilities to develop a new generation of electronic devices which are both using very little (and perhaps zero) rare elements and which are designed for complete (or nearly complete) recycling. The basic element of all electronic circuits, transistors, can be made using silicon and, in general, there are alternatives to rare metals for most devices, even though in most cases not with the same performance. For instance, light emitting diodes (LEDs) are currently based on gallium nitride (GaN) and there seem to be no comparable substitutes. Without LED, we would have to go back to the old cathode ray tubes (CRTs) which we consider primitive today. But, after all, CRTs performed well enough for us up to not many years ago. So, it would be an inconvenience, but not the end of the world. So, it is clear that we'll have to settle on reduced performance if we want an electronics without rare elements, perhaps on a strongly reduced performance. But maybe we don't need the kind of performance we have been used to in order to keep going. Think about your smartphone: it is an incredibly complex and powerful device used mostly for trivial tasks such as looking at clips of cute kittens and sending likes and thumbs-up to other machines. Does "civilization" really need these devices? It is all to be seen. The View From Les Houches: What Are Models For? Sandra Bouneau, researcher and lecturer at the university of Paris-Sud, shows her model at the School of Physics in Les Houches, France, in March 2018. As you can see from the image, her model is complex and detailed. It is one of the several models presented at the school which attempt to describe the trajectory of the transition. Overall, all the models based on physics (including Bouneau's one, as far as I understood it) arrived to similar conclusions, confirming the calculations that myself, Denes Csala, and Sgouris Sgouridis published in 2016. In practice, the transition is possible, but it won't happen all by itself. The economic system needs to be pushed in the right direction, in such a way that it will be able to provide the necessary investments. The problem is that the system is not being pushed hard enough. 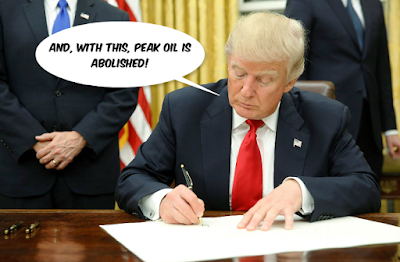 Some parts of it, including the US governments, are pushing in the wrong direction, dreaming of an impossible "energy dominance" (and even if it were possible, what good would it be for America?). At the bottom of the whole problem, it is the fact that policy-makers don't believe in models, although they may declare the opposite. There have been many models developed during the past century or so which would have created a different world if the powers that be had acted on the advice provided - first and foremost "The Limits to Growth" of 1972. But that model was not only disbelieved but positively demonized. In the end, All models are made to search for trajectories which avoid collapse, so ignoring models ensures collapse. And that's what we are doing! School of Physics in Les Houches, France, March 2018. Juergen Miknes shows some of the concepts that he has developed in his parallel analysis of thermodynamics and economics. It is a remarkable synthesis that you can find described in detail here. In the slide above, he suggests to replace the Cobb-Douglas function, commonly used in economics, with a function based on the concept of Shannon's entropy. I am not sure of a number of things in Miknes' work, in particular the idea of equating (in some ways at least) the growth of entropy with the growth of production. Nevertheless, it is a fascinating work. Something that surprised me (but probably I shouldn't have been surprised) was how strongly Miknes was challenged by an economist in the audience. Apparently, economists don't like their field invaded by those pesky physicists. So far, economists have been able to keep physics away from their secluded garden and continue keeping the field open only to people with the right credentials (according to them). For how long, it is all to be seen. Perhaps surprising, this model, presented first in the 1920s, is enjoying a new life today and it was mentioned in several talks. Long considered a toy for freshmen in biology, it turns out to be extremely rich in its capability of describing the stepped dissipation of thermodynamic potentials in a nonequilibrium system. Dr. Rostom modified the model in order to take into account economic and monetary factors, but even the "raw" LV model can describe real-world phenomena. It was found to be at the basis of the Hubbert Curve (Bardi and Lavacchi, 2009) and it was recently shown to be able to describe the cycle of exploitation of fisheries (Perissi et al. 2017). And, of course, the model is at the basis of the dynamical interpretation of the "Seneca Effect"
The View From Les Houches: Can We Move to Renewables Fast Enough? Les Houches, March 2018. 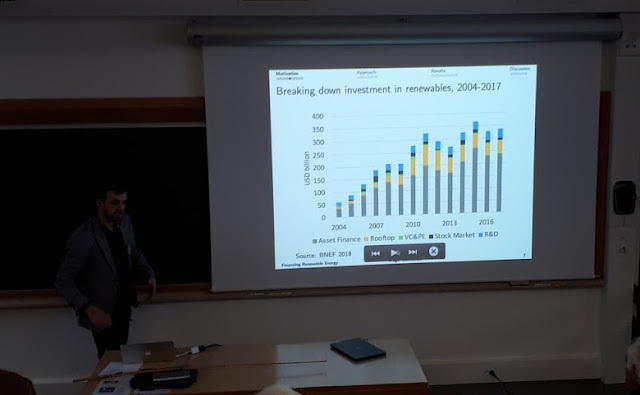 At the School of Physics on the Energy Transition, Gregor Semieniuk of the University of London shows the updated trends in investments in renewable energy. 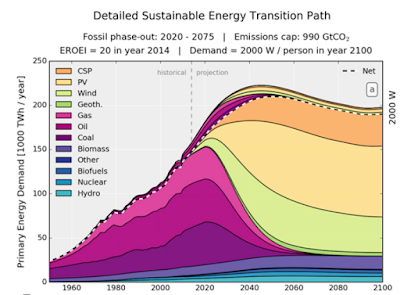 Just a few years ago, there was ground to be optimistic about the energy transition. Renewable energy production showed a robust growth and the same happened for investments. If the trend could have continued, renewables would have swamped away fossil fuels easily and seamlessly. Instead, something went wrong in 2012. The growth of investments stalled, it went up and down for a few years and, by now, it is clear that it has plateaued. Investments in renewable energy are not growing and we don't know if they will ever restart growing. While it is true that the prices of renewable energy are going down, at these investment rates it is clear that we can't go through the transition fast enough to comply with the Paris targets. Possibly, we won't even be able to replace fossil fuels before they become too costly to produce. This is the result that myself and my coworkers Csala and Sgouridis obtained two years ago. According to our calculations, humankind would need to invest at least ten times as much, likely much more, in terms of energy to go through the transition fast enough. In his talk, Gregor Semeniuk showed other estimates confirming that the investment rates in renewables are not sufficient for what we need to do. The gist of his presentation was that if governments don't intervene, the transition will not happen fast enough. He showed several examples of past transitions which took place mainly because they were driven by the resources provided by the state.You can find the hugely interesting paper on these matters by Mazzucato and Semieniuk on "Technological Forecasting and Social Change" and also more material at this link. 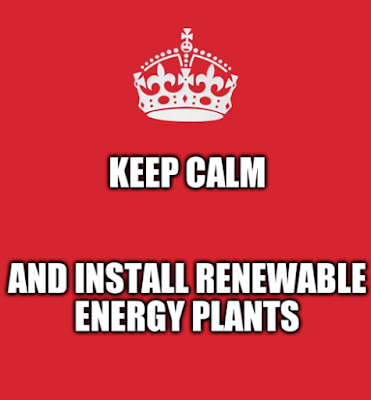 There remains the fundamental problem: how do we increase investments in renewable energy? Our faith in the free market is not helping us in this issue. 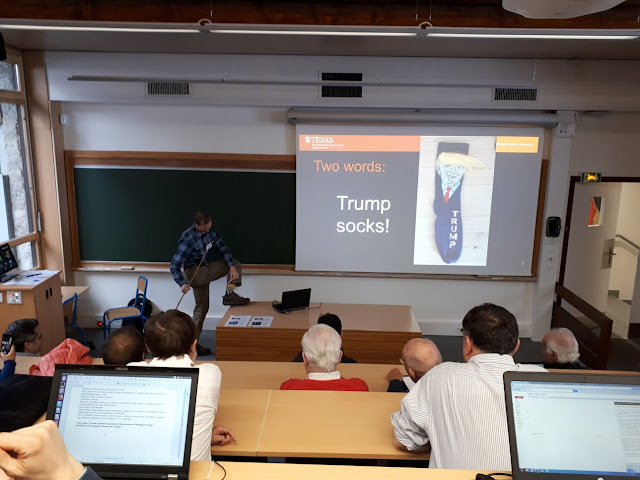 Above, Carey King from the University of Austin, Texas, shows his Trump socks during his talk at the meeting of the School of Physics in Les Houches, France. I strongly suggest to read King's hugely interesting paper titled Information Theory to Assess Relations Between Energy and Structure of the U.S. Economy Over Time. You may find in it aswers to questions you have been asking yourself for a long time. The School of Physics in Les Houches, France held a session on Energy Transitions during the week from March 4th to March 9, 2018. About 70 scientists, mostly physicists, gathered in a remote village in the French Alps to discuss the energy transition, the supply of mineral resources, and climate change. It was one more attempt by scientists to save the world. Having been there, I can say that the task is difficult but this group managed to come up with several good ideas, some of which might even work. Nearly definitive results of the Italian national elections of March 4, 2018. the "five-star movement" (M5s) got the most votes, although the center-right wing coalition (CDX) has the largest number of seats in the Italian parliament. For the center-left (CSX), it was a total disaster. So, what made the M5s party so successful: my impression is that their mode of functioning could be described as "government by Facebook, for Facebook, in the name of Facebook." Is it our political future? In several senses, it is not difficult to understand the results of the recent Italian elections. Think of the center-right leader, Mr. Berlusconi, as an older Mr. Trump. At nearly 82, Mr. Berlusconi still tries to play the role of the alpha-male while his acolytes built up a program based on building a barrier against immigrants (not exactly a wall, because there is a sea in between Italy and Africa, but the concept is the same.). The center-right is also pursuing policies akin to "making Italy great again" (or perhaps grate again, if they were referring to Parmesan cheese). In short, the Italian right and the American right are very similar, including such details as allowing citizens to carry firearms. But how about the "five-star" movement? Who are they? Why did they win? For sure, there is no equivalent of the M5s in the US or anywhere in the West - so far. Their strong point, it seems, was the obsolescence of the traditional political parties. Politicians are widely perceived as thieves and, perhaps worse than that, they are deeply embedded and compromised with the "system." In the US, the "system" is mainly represented by the military-industrial complex, pushing for more and more money for more and more useless wars overseas. In Italy, there is less emphasis on the military system, but the government is surely embedded with this and other traditional power centers, including the oil and gas industry. Otherwise, how would you explain that the Renzi government engaged in the destruction of the Italian renewable energy industry, killing tens of thousands of jobs? Do this and more idiocies, and eventually, the people will remember that and punish you, if they can. In the end, Italians seem to have reasoned that their political system is so deeply corrupt to be unrecoverable, at least in terms of the traditional political forces (e.g. the left). So, they rewarded a force claiming to be composed of honest citizens - in a way amateurs rather than professional politicians. And the M5s movement won despite the concerted effort of both the Left and the Right to defame them. My impression, however, is that there is more than that. The M5s movement may be the harbinger of things to come.Maybe the M5s success will turn out to be short-lived. But the great intuition of the founders of the M5s movement (Beppe Grillo and Roberto Casaleggio) that social media are destined to become more and more important. And that not just as tools for politics. Social media are becoming politics. If you look at how the M5s movement works, you see that it is unlike anything you would call a "political party." I could say it looks like more like a version of Facebook. No leaders, no plans, no ideology, just a general idea that a networked group of people debate to find the best solutions for the problems we face. It seems to work - it is a new way to manage the system. Government by Facebook, in the name of Facebook, for Facebook? Maybe. *Note added on March 9: As we might have expected, Putin has been accused to have meddled in the Italian elections. The task fell on Samantha Power, former UN envoy during the Obama administration, presently in the midst of a scandal involving abusing her of power when she was at the UN. I don'think anyone took that seriously on either side of the Atlantic Ocean. Power's tweet was ignored by the American press and ridiculed in the Italian press in the rare cases when it was considered worth of attention.